There really is some hope at this point :O) They don't seem to be growing quite as quickly as I had thought. Maybe the lady at the feed store was mistakes about their variety?? I certainly hope so because I really am starting to enjoy having them around and I have already made a little friend. Her name is Rapunzel, yes my 4 year old named her. 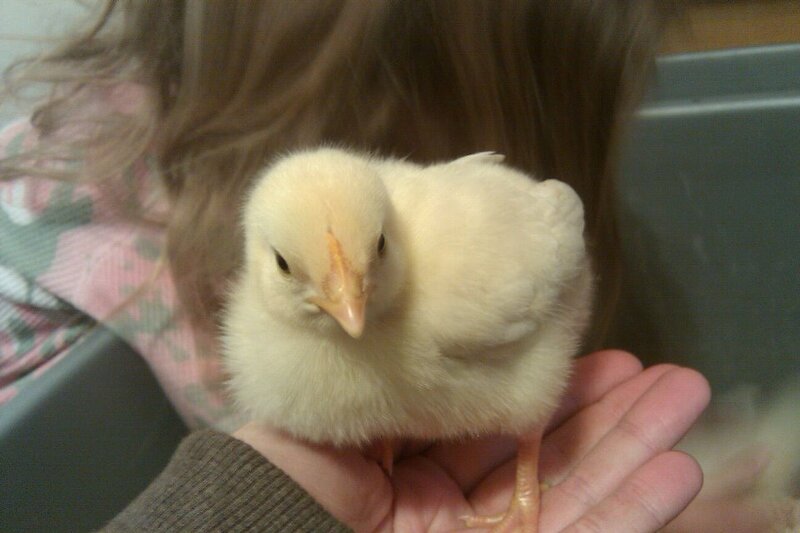 She is the biggest of the three little chicks and certainly the bravest as well. She is just getting in her wing feathers and has yet to get any others. I must admit I have never put this much thought into raising a chicken. Diet and exercise as well as just some love I'm certain at this point my husband thinks I have lost my mind! They are still going without a heat lamp at night and sleep really good! after the lights go off at about 9 it takes them maybe five minutes and they are fast asleep until my husband wakes up at 4:30 in the morning. *SIGH* I have changed from actually putting a feeder into their pen every couple hours to simply taking some food and spreading it about their cage. They really seem to love scratching about and finding food and since one of the main things I am reading is their lack of desire to do so I figured it would be a good thing to encourage. I really hope this positive swing in raising these Cornish Rock crosses continues maybe I'm just the chicken whisperer lmao. A chick named Rapunzel? Cute. Have you read Rapunzel's Revenge? My kids (aged 9, 7, and 6) got this one from the library and they read it every night. It might be for older kids though. It's a graphic novel for pre-teens, so your daughter might not enjoy it. But I bet you will. My husband and I loved it just as much as the kids do.